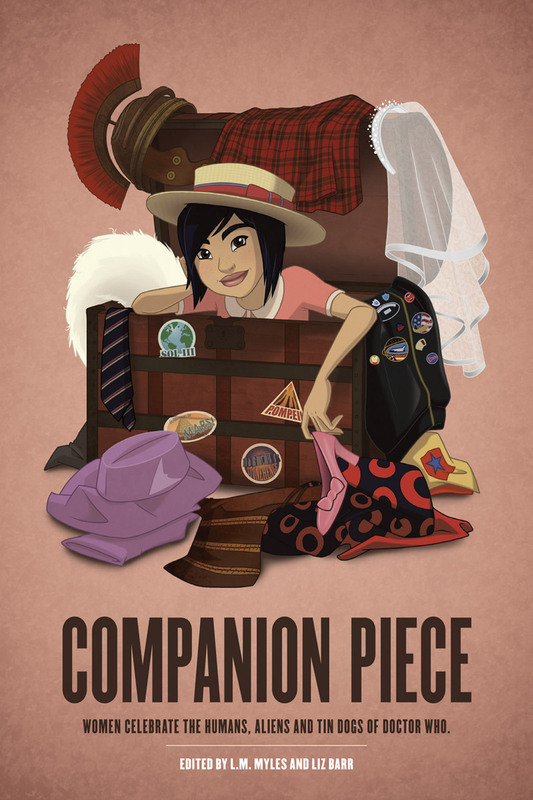 Today is the official release date for Companion Piece, an essay anthology about the humans, aliens and tin dogs of Doctor Who, edited by myself and Liz Barr. It’s got over thirty essays on the companions of Doctor Who, from award-winning and New York Times best-selling authors, to fans for whom this is their first published writing gig (you can see a complete table of contents here). It’s a celebration of all those wonderful characters that travel through time and space with the Doctor over the past fifty or so years, and why we love them, and what delights, and what disappoints. The companions of Doctor Who have had a lot of criticism aimed at them over the years. In the classic series, they’re useless screaming ankle-twisters only there to look pretty. In the new series, every one must be the perfect representation of the feminist ideal to every woman, or she’s rubbish. Going back as far as Sarah Jane, we’re told that this new companion is finally going to stand up to the Doctor, and be his equal. Because there can be only one really, properly good companion. In Companion Piece, we wanted to share what these characters mean to us, as fans and viewers, and appreciate what they each brought to Doctor Who. I’m so proud this book is finally out there. It’s been a long time in the making! (Liz and I first discussed this way back in 2010!) and I’d like to thank her for her general amazingness and excellent work, and all of our fantastic writers, our publisher Mad Norwegian, the book’s designer Adam Holt, and our cover artist Katy Shuttleworth. You can hear me talking a bit about the book on this week’s Radio Free Skaro, and this month’s Doctor Who magazine is running a competition with the opportunity to win a copy of the book. And here’s a review from Starburst magazine that’s awfully nice. So, yes, please do buy, and read and review; it’s a rather splendid book! And is available at amazon.com, amazon.co.uk, on the Kobo and the Kindle. – My essay for issue 3 of Uncanny Magazine is now freely available on the Interweb. (As is the entire second half of the magazine.) It is a completely objective discussion of how amazing Peter Cushing is in science fiction. Ahem. – So this got announced yesterday: I’m writing a Lethbridge-Stewart novel! Which is a *smidgen* exciting. There’re more details about this series of spin-off novels (and a freebie e-book) over here. – I don’t know about to say about Verity!’s April 1st episode. I’m appalled, frankly. APPALLED. – Technically this episode of The Writer’s Room podcast is people reading out Doctor Who story titles for two hours. TECHNICALLY. It’s actually ridiculously fun, and may have you yelling at your computer rather a bit when they are being wrong.